Whoa, where have I been?! Well, I took a little hiatus I guess you could say from the blog world. Between work things, family fun, summer fun etc. It was just something I decided to break from. But I’m back! So with that…. **Two of our friends (different couples) both welcomed babies into their lives this weekend! One couple had a little girl and one had a little boy. In celebration Grayson has decided to revert to newborn sleeping habits….one hour naps, getting up at the a$$ crack of dawn aka 4:55. This kid is going through some sort of WEIRD sleep regression. I’ve read that it can happen around 18 months, and that it’s one of the worst ones! AWESOME. **But seriously, congrats to our friends! You are all in for one awesome journey and I can’t wait to meet the newest members of your families! **Did you know August is actually my least favorite month of the year?? I know, crazy! Especially because that is the month my husband celebrates his birthday! Nothing against August 20th (we will let that day slide in the month). I don’t know if it’s because I’m ready for Fall to begin, the fact that it’s always 5 freaking weeks, or that the State Fair (not a fan) happens….I just don’t like August. **I couldn’t wait any longer, I had to break out some Fall decorations. I found my Fall wreath and put that up and started lightening all my Fall candles! Now, if it were 20 degrees cooler…..
**Curt and I have been binge watching Netflix shows, currently we are watching Dawson’s Creek. I watched the show when it aired and loved it. But now….I think every scene should have “Cry me a River” by Justin Timberlake in the background. These kids are SO DRAMATIC!!! Seriously, did I relate to them in high school!? I currently have a love/hate relationship with the show now….PS. I’m Team Pacey! 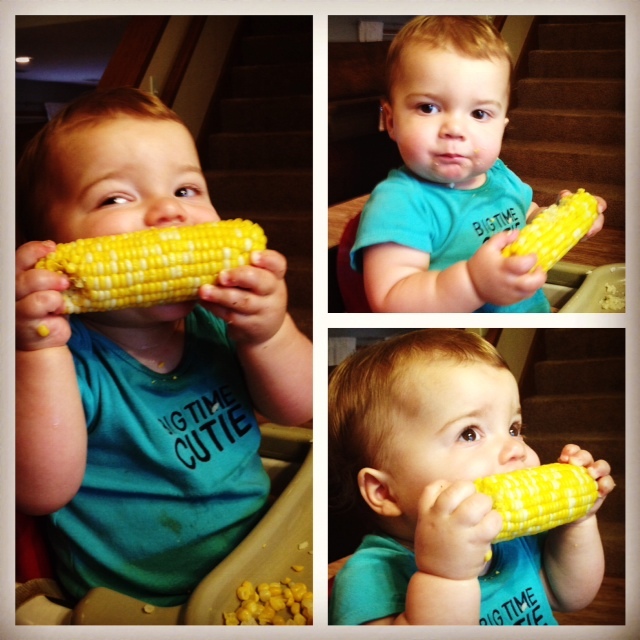 Because of my long hiatus I thought I owed you a photo….Enjoy this one of Grayson enjoying some local sweet corn. Probably the last of the season for us! 🙂 I’m ready for all things pumpkin!